My Theory About The Secret Of Little Busters! Warning: Spoilers for the Refrain anime so far. In a matter of hours, I suspect we shall all know the truth about Little Busters! I figured it would be appropriate to tell you all what I had been speculating all along about the secrets of the world. The magical realism of LB! makes complete sense when you realise that Riki has been hallucinating about this idea of having friends. The drugs make him think that he is seeing things that do not in fact exist. It completely warps his worldview. This symbolism shows in the OPs of each season. 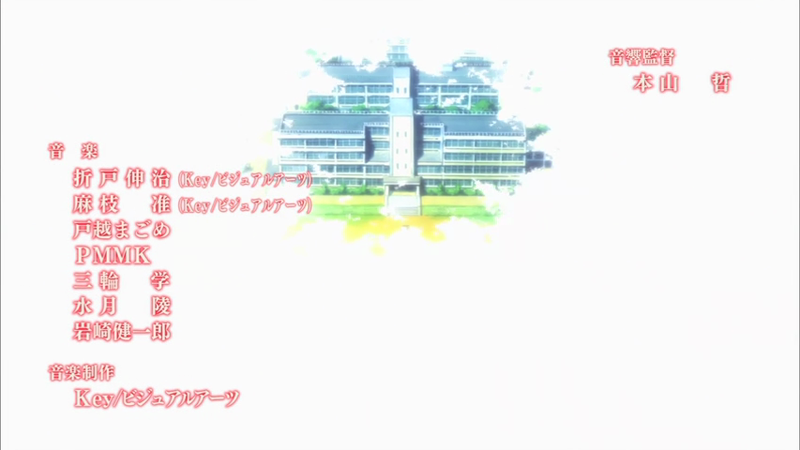 If the first season of Little Busters! was about Riki experimenting in drugs and fantasising about having a bipolar group of friends, Refrain is about him learning how to get off the drugs and find other, healthier ways to cope with his stress. Episode 5 gives you a good reason for why he resorted to them in the first place. Kyousuke tells Riki about a bunch of students from another school who were killed in a traffic accident, and how only two of them survived. 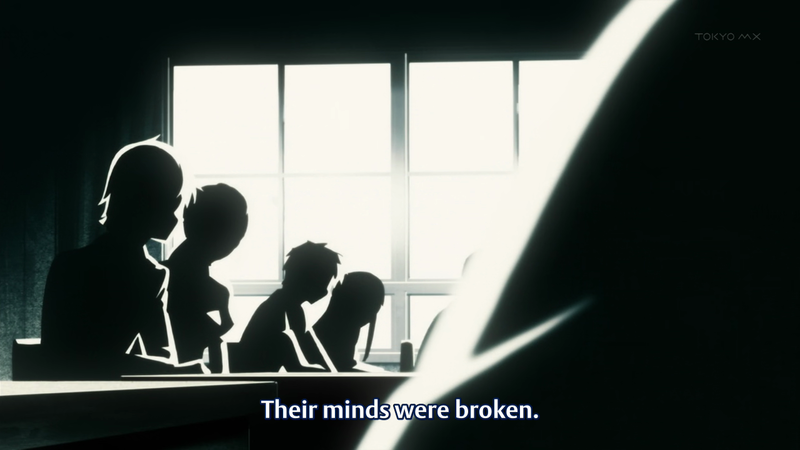 I think that in reality, the students who were killed were the Little Busters and that the survivors were Riki and Rin. Basically, everyone got hit by a bus and died. In his depression, Riki desperately sought to relive his childhood. When he started taking drugs, in his mind all of his friends were alive again and he blocked himself off from recalling that they are all in fact dead. This is why whenever Riki gets close to discovering the “secret of the world”, he has an attack of narcolepsy. This is a clear side effect from taking too many drugs. However, Kyousuke’s ghost understands that Riki and Rin must move on or else they would never be able to handle the real world. His goal is to make sure the two of them live out their youths as strongly as possible and to build up the mental resilience to face their tragic reality. 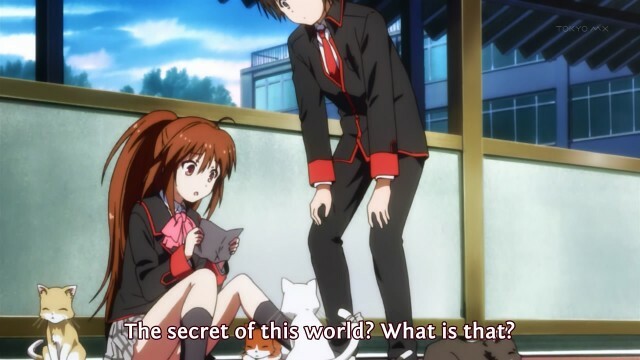 This is why the Little Busters form a baseball team. The purpose of the girls was so that Rin could gain friends and Riki could gain experience in dealing with people with messed-up problems. This gives him perspective for later, when he finally learns to ~Refrain from the drugs. The story is about learning to treasure your youth and then building up the courage to let go. Therefore, the drugs represent the escapist desire that comes over all of us and compels us to cling to a fantasy even when we know the end is nigh. 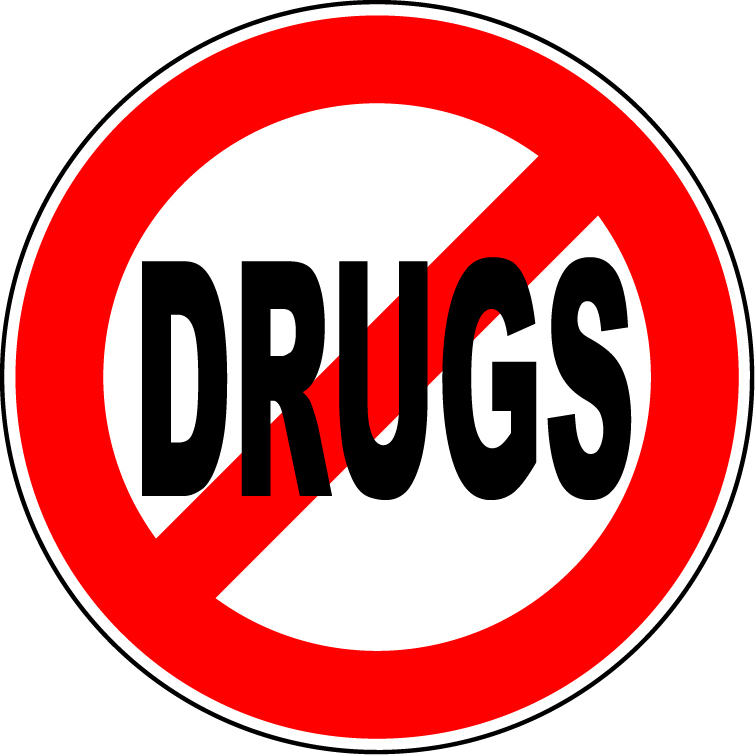 The drugs are a metaphor for how we live life. 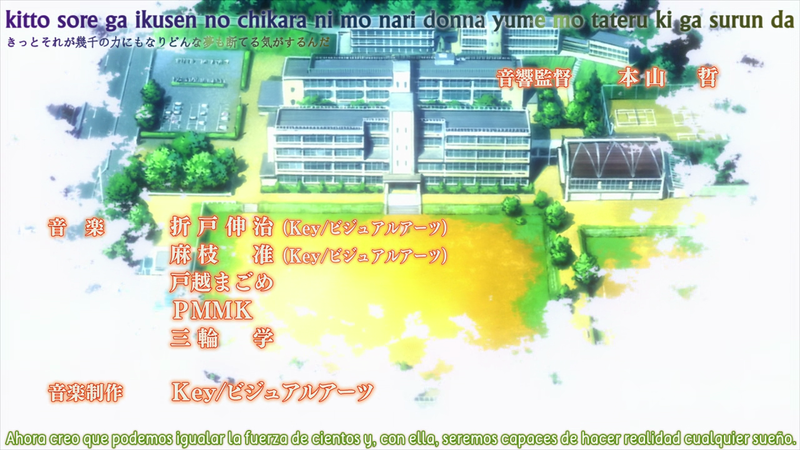 And now you know the secret of Little Busters! and the meaning of the title. The moral of the story: Don’t Do Drugs. Posted on November 9, 2013, in Anime Analysis, Funny Anime Stuff and tagged all my feels, fandom reactions are better than the real thing, i don't know what i was on when i wrote this, little busters, refrain is so good it feels like a completely different show, yeah i was trolling. Bookmark the permalink. 19 Comments. Rather than drugs, I just assumed Riki’s been on life support ever since the crash (and perhaps Rin too?). Either way though, in the end I think Riki will have to “transfer schools” as well, because that will be literally returning to the real world, I imagine. LOL I was tongue-in-cheek about the drugs, but I meant everything else seriously, and I’m surprised to see how much your ideas have overlapped with mine! Then again, the VN players have been telling me the foreshadowing is heavier in the anime, so maybe that’s why. I did wonder if you were joking, but I do find it within the realm of possibility. Mainly because drug use has been a plot point in a Key anime (again, Angel Beats), and it wouldn’t be the only dark situation Little Busters has dealt with (e.g. bullying, child abuse, suicide, etc). At any rate, I think it’s probably a good thing the anime has been a bit more clear than the VN about what’s going on (assuming we’re on the right track at all). The comparable “mystery of the world” for Clannad’s anime IMO was too cryptic for its own good, which made me not care for its “hints” and not really like the “okay, everything is magically better now” ending. What works for a VN won’t always work for an anime; different mediums need to go about things differently. VNs are perhaps especially tricky because they are so dense, meaning letting things gradually build up and having a subtle hint or two every thirty or so hours of game time can work okay there. But not so much in most other mediums (save of course, for very long books). Angel Beats was written after Little Busters. Once you find the real secret, you’d see a connection between the themes of Clannad, Little Busters and Angel Beats – it’s very much a development and expansion of the same theme and over-arcing idea. It reminds me again that Angel Beats deserved 48 episodes to do it’s cast herd justice, and got a crummy 13 instead. I can tell you that you are definitely right in one thing: you are both right: this world is dreamlike indeed (the Kurugaya route more or less outright confirms it, so I am confident that this is not a spoiler), but I’d ask this question: are Riki and Rin the only dreamers? Also, after seeing Riki’s behavior as they portrayed in in this episode, I think I can see where your drug theory comes from. After all, Kyousuke’s sudden shift into outright dickery and villainy, and Riki’s seemingly overblown paranoia almost makes it seem as if Riki is in a drug induced delusional haze of paranoia. Brilliant deductive skills and identification of themes. I give you a B+. You lost points for inaccuracy in the ultimate conclusions and the terrible “Refrain” pun. But don’t let that discourage you from wordplay in the future. As the old refrain goes, practice makes perfect. This in a separate comment in case you judge it too spoiler-ish. I do think he is in a hospital or something, judging by that bus accident (no way it’s not related to Riki and Rin). As for the very reason behind the story, I have no idea. He’s in coma? He’s dying (doubt it, but since the characters “disappear” it wouldn’t surprise me if they acted as blabla wishes Riki got to fulfill before passing on)? No idea. But something about his world is changing, at least. Ha ha, I’m pretty sure your guess is close to the truth, though I still don’t know because I never played the game. I look forward to seeing if you turn out to be right! You’re completely anutterly wrong. The fact that you think drugs were involved is laughable. What? No, they were in an alternative world. Was this posted before the anime finished? Yep, take a look at the publish date: 9th November.